Cakes should always be perfectly made; after all, these delicious treats are the centerpiece of every celebration. The problem is, cakes are arguably the hardest recipe to do in the culinary world. 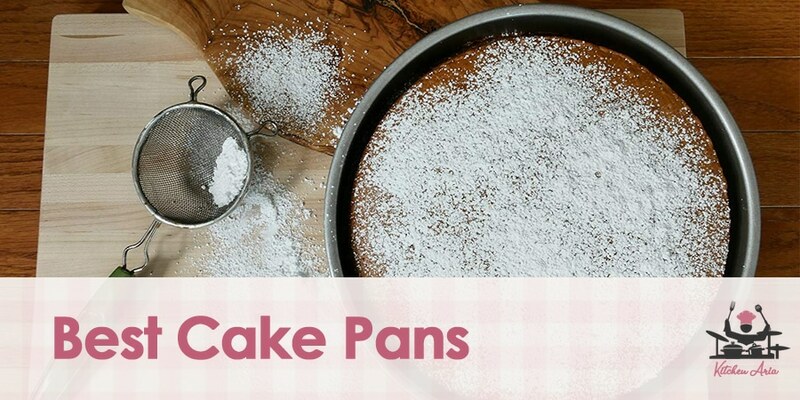 There are a lot of factors to look into when making a cake – one of them is a cake pan. With the best cake pans at your disposal, making a high-quality cake is easy – although it will still rely on your skills and ingredients. That said, looking for a quality cake pan isn’t easy. To help you with that, we’ve reviewed the best cake pans for your cake baking needs to provide you with some insight. The size of your cake pan is an important factor in how well it works on certain cake recipes. Select the cake pans that are designed according to what kind of cake recipes you’re going to make. For instance, a circular cake pan is best used for making round cakes, while cupcakes need cake pans that have a dozen or more round sockets on them. Some cake pans are made with substandard materials that can ruin the appearance of the cake, especially those that aren’t made of non-stick materials. The most common feature of cake pans is that they’re made of aluminized steel and coated with a non-stick coating. Aluminized steel enhances the cake pan’s capacity to conduct heat evenly, thus baking the cake efficiently. Meanwhile, the non-stick coating makes releasing the cake from the cake pan easy. If you’re making more than one cake recipes or a huge quantity of one cake recipe, then you’ll need multiple cake pans of different types. Making a cake is a very time-consuming task – making multiple cakes is even so. Maximize the number of cakes you’ll make in a certain period of time by using multiple cake pans to finish them as soon as possible. As the name implies, this type of cake pans is the most commonly used. It’s considered as the standard choice for making various kinds of cakes. A traditional cake pan is often shaped into common shapes such as rectangular, circular, and square. Also, a traditional cake pan has a flat bottom and high straight sides to make cakes that are perfectly leveled on each side. Cupcake pans typically have a dozen circular sockets on them where you pour the ingredients, although there are some with lesser or more sockets. This can help you make dozens of identical cupcakes or mini-cakes with a uniform size and shape. That aside, these pans are what professional pastry chefs use to make hundreds of cupcakes/mini-cakes within the shortest amount of time possible. Cake rings are similar to the traditional cake pan. They’re ideal for making various kinds of layered cake and have high straight sides. The difference is that they do not have a bottom. Instead, you will have to use a baking sheet or baking pan as its base. The good thing about cake rings is that you can easily slide it up once your cake is finished without the risk of ruining it. Sheet cake pans are most ideal for thin cakes that are rolled (ex. Yule logs) once finished. They are rectangular in shape with upturned edges and are shallow, usually an inch deep. They can also be used as the base for cake rings. When using a sheet cake pan, it is highly recommended to use pan liners and parchment papers to prevent the cake from sticking to its surface. This type of cake pan is best used for cakes that need to be formed into various special shapes such as hearts, stars, animals, and many more. Novelty cake pans are readily forged into such shapes. All you have to do is pour the batter in the cake pan, and it will do the shaping for you. Also, you don’t have to hassle yourself sculpting the cake’s special shape with your bare hands. Just remember to flour or grease the corners of the pans to avoid the cake from sticking. If you don’t do so, then the shape of the cake will be ruined. Such cake pans have adjustable sides held by a clamp and a removable button. Its features are ideal for cake recipes that can’t be turned upside down when cooling such as tortes, crumb cakes, and cheesecakes. You simply have to pry open the clamp in order to release the sides once the cake has already cooled. These cake pans are used for making ring-shaped cakes, just like donuts. Bundt cake pans have holes in their middle which gives the cake a ring shape. They have domed bottoms to shape the cake round, and some have angular bottoms to make cakes with complicated designs. These cake molds enable you to conveniently remove the treats from the molds when they’ve already cooled due to its silicone material. They are often used for cupcakes and allow you to make dozens of desserts with uniform sizes. Some cake pans are designed to make your cake look creative, such as forming them into unique shapes. Most importantly, children will be fond of special looking cakes. These types of cake pans are commonly used in cake making competitions and special celebrations. They’re mostly known as novelty cake pans. Choose cake pans that possess qualities that will make them last longer, such as those that are resistant from scratches, abrasions, bents, and dents. Try to avoid cake pans that are made of very thin metals as they can be bent or dented easily. A good example of durable material is silicone. Silicone is very flexible and can withstand sudden temperature changes. You can even store silicone pans directly into the freezer from the oven. This oblong-shaped cake pan has a non-stick coating, allowing the easy release of the cake. Additionally, it is easy to clean especially with warm soapy water. It has a heavy gauge construction which prevents warping and enabling heat to spread evenly. This is a round cake pan which is made of aluminized steel. It gives you a quick and convenient cake release, not to mention it’s easy to clean with hot water, sponge, and mild soap. This cake pan is coated with PFOA, PTFE, and BPA-free silicone coating. This 9-inch round cake pan’s surface has a micro-textured pattern, thus reducing contact with the cake and allowing airflow underneath. It distributes heat evenly due to its aluminized steel material which also gives durability to the cake pan. It is coated with a ceramic-reinforced, non-stick, PTFE-free coating. Also, it’s built with square roll-edges for convenient handling in and out of the oven while wearing an oven mitt. The cake pan’s manufacturer offers to repair or replace an item free of charge if it has defects. This one’s an angel food cake pan by Nordic Ware which is made of cast aluminum. It distributes heat efficiently and evenly to ensure beautiful results. It has a capacity of up to 16 cups with a diameter of 10 inches. Moreover, it is coated with a premium non-stick coating to provide you with quick food release and ease when washing it. This US-made round cake pan provides you with quality baking results due to its commercial-grade aluminized steel which conducts heat evenly and consistently. It’s Goldtouch ceramic-based non-stick coating provides the cake pan strong resistance against scratches, abrasions, rust, and corrosions. It is built with extra-thick rolled edges for convenient handling and prevention from warping. This 9-inch round cake pan is made of heavy-gauge aluminized steel which conducts heat efficiently and evenly. Both its interior and exterior are coated with Whitford xylan non-stick coating, providing you with easy cake release and ease when washing. It also prevents warping due to its thick rolled edges. This round cake pan is made of anodized aluminum which makes it durable and long-lasting. It can bake various other recipes aside from cakes. It has no other extra metal and chemical coating, making it free of PTFE and PFOA. Storing it in the freezer is certainly safe. It is easy to clean with bare hands and is trusted by professionals around the world. It also comes with a lifetime warranty. This springform pan by Hiware fits and works efficiently in pressure cookers measuring from 6 to 8 quarts. It is coated with a double layer non-stick coating for easy release of the cake without the risk of damaging it. It’s also free from toxic and hazardous chemicals. The coating also provides you with ease when washing the pan. It can withstand temperatures of up to 450 degrees Fahrenheit. Moreover, Hiware will offer you a 100% money back guarantee if you’ve purchased a pan with major defects. This round cake pan is perfect for cakes in all kinds of celebrations. It is made of aluminized steel which enables even heat conduction and distribution. It can also prevent warping due to its enhanced wire rod rom. It is coated with a non-stick, silicone base coating for easy cake release and cleanup. This cake pan is coated with layers of non-stick coating for convenient and long-lasting food release. Its heavy-gauge steel material evenly distributes heat for consistent baking. It is a guaranteed dishwasher-safe cake pan which is covered by a full lifetime warranty offered by Calphalon. We know for a fact that making a cake is no easy task; however, such task can certainly be made easier with the use of the right tools – one of which is a durable and reliable cake pan. Just like using the best muffin pans for creating muffins, using the best cake pans will allow you to come up with great baking results.